Aylesbury Prune is a traditional English culinary damson, which used to be grown commercially on a small-scale in the Vale of Aylesbury and surrounding areas of Buckinghamshire and Bedfordshire. The fruits are small, blue-black in colour, and the stone is clinging. Please fill in the details below and we will let you know when Aylesbury Prune damson trees are back in stock. Aylesbury Prune is in flowering group 2. Aylesbury Prune is self-fertile and does not need a pollination partner, although fruiting may be improved if there is a compatible tree of a different variety nearby. Although usually trained as a bush-tree for best fruit production, Aylesbury Prune can also be grown as a fruiting hedge. It is likely to be tolerant of chalk, since the Vale of Aylesbury borders the chalky soils of the Chiltern hills. Aylesbury Prune is assumed to originate from the Vale of Aylesbury, a traditional fruit-growing area to the west of the Chiltern hills. As well as its culinary uses, Aylesbury Prune damsons were also used in the manufacture of clothing dyes. As with many old damson varieties, its origins are unknown, and it is not even certain whether it is a true damson (Prunus insititia) or a plum (Prunus domestica) or a natural hybrid. 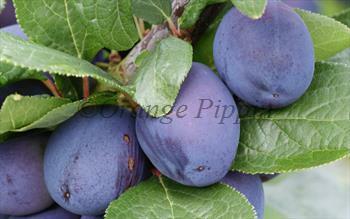 However like many damsons it grows relatively true from seed and is also easy to propagate on its own roots.